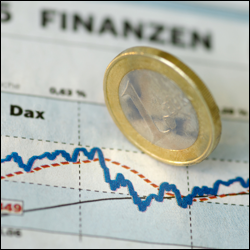 We are set to see a soft open for European shares on a lack of overnight cues. With the US out of action yesterday, and Asia seeing mixed trading this morning, there's not much driving sentiment. There will be some economic data out in the form of EU Flash CPI, but an expected decline to 0.3% shouldn't offer many surprises and Mario Draghi has already firmed up expectations for sovereign QE next year. Instead, markets are likely to drift as traders try to hang onto respectable gains for November and get ready for next week's big data and central bank deluge. As US markets were closed for the Thanksgiving holiday, UK shares were kept in a tight range and ended largely unchanged. However, Goldman Sachs recommended Barclays so investors pushed the bank's share price up by more than 2%. Conversely, Royal Dutch Shell fell by 3.7% following OPEC's failure to cut output. European equities are looking to open higher this morning, but continental markets are likely to outperform their peers. The firming up of expectations that the ECB will start buying sovereign bonds is powering Eurozone markets higher, particularly the DAX. Mario Draghi and Jens Weidmann will be speaking today and there is some cautious optimism building before the open that they will be singing from the same dovish hymn book as their colleague Vitor Constancio, who dropped some very big hints about sovereign QE in 2015 yesterday. In contrast, the former star economy of the UK is slightly less optimistic after recent hawkish comments from Mark Carney. The FTSE is also being held back by caution ahead of today's OPEC meeting. Whilst the organisation might offer some token gestures, energy markets are not expecting to see any real production cuts and so oil prices should remain low. This in turn would be a dampener on the heavily energy weighted FTSE. Not only is the US economy recovering at the fastest pace among the developed world, but confidence is growing that its strength can now weather a slowdown abroad. Yesterday's economic data was, by and large, better than expected, with corporate results still surprising to the upside. This saw the Dow Jones continue to rally and reach another all-time closing high of 17,841. Overnight gains in Asia are set to see European equities track higher this morning. Yesterday's mixed bag of data from the US led to fairly flat finishes as growth improved but consumer confidence saw a surprising slump. The US GDP data was better than expected at an annualised rate of 3.9% and managed to keep investors in a good mood despite a weaker reading of 88.7 for consumer confidence. The cautious optimism pushed the Dow Jones 23 points higher to 17,839, though the strong growth number also helped cap gains as traders fretted about a hawkish Fed. With the benefit of a little more time to digest the figures, Asian markets have weighed things up and tipped the balance in favour of the bulls by registering modest gains. Growth will be in focus again today as we get the second estimate for UK Q3 GDP and this will be a good reminder of the growing chasm that's developing between the US and everybody else. Even though the rest of the global economy looks shaky, markets seem happy to ignore their own domestic plight and instead believe that a rising US can drag up all the other laggards. How long that can last is anyone's guess. Stock market indices are set to edge higher at the European open. With mixed closes across the globe yesterday, and Asia currently unable to get a consensus of what's going on this morning, we can see the indecision that traders are wrestling with at the moment. Although central banks around the world seem to be chucking the kitchen sink at the global economy, Jens Weidmann's comments yesterday, that ultra-loose monetary policy 'cannot permanently boost growth prospects', is an uncomfortable truth that most market participants know to be true. Ahead of the latest US consumer confidence data, the Dow Jones climbed 13 points to a new record high closing level of 17,818. The gains in US stocks, albeit pretty tiny ones, were driven by rallies in financial services firms, yet another sign that the economy is improving. European equities are set to start flat, already fully digesting Friday's central bank euphoria. A surprise rate cut from the PBoC and a big hint from Mario Draghi that outright sovereign bond purchases are getting closer sent stocks soaring. However, the dovish news wasn't enough to keep the rally going in the US session. Whilst the major US indices did notch up yet more gains, they closed well off their session highs. The marginal rate of return on each attempt to pump up a flagging global economy seems to be deteriorating fast. With so many of the world's major central banks falling back on loose monetary policy at the same time, the more suspicious traders are wondering how dire things really are to warrant such action. Although the bulls are happy to play along with the charade of rising equity prices, the fact that economies which contribute 42% of the world's GDP (European Union: 23%, China: 12.7% and Japan: 6.5%) are still having to resort to such measures should be ringing alarm bells. The Dow Jones reached a fresh all-time high on Friday, just shy of 17,900, largely on the positive US economic data. From the housing sector to the labour market, the recovery is now becoming strong enough to withstand weakness abroad. At the same time, more than three quarters of corporate earnings surpassed estimates in the latest reporting season, fuelling investor optimism.